Where do you like your outfit variety ? Do you like each of your garments to have a different style ? Or perhaps you wear mainly similar styles, but in different colours or textures ? A very small range of colours : mainly white to black, and denim blue. A very small range of surfaces : all smooth solids. A very small range of fabrications : cashmere knits, broadcloth, denim. A very small range of shapes : close fit knits, crew neck tees, shirts, slim pants. And only one overall clothes style : very casual. Minimum variety in the style elements of these clothes – though the general idea of this ‘creative’ style is not minimalism at all, as there is a lot of emphasis on noticeable and individual accessories. Of course you haven’t got to use minimum style elements in your clothes for a small wardrobe. Here’s some of the usual ways of adding variety. Janice chose white, grey, black/ tan/ chambray and denim blues for colour. All in smooth fine textures and solid colours. In general, use your own best dark and light neutrals to copy this idea. Or of course use only dark or only light, if that works best for you. Black and chambray-denim blue aren’t flattering colours for me. My basic neutrals are white, grey, tan. And what about fabrication ? Imogen Lamport at Inside-Out Style has an interesting piece on changing the level for refinement of your clothes from casual to formal by changing the quality of the fabrics. And what about tonal variations around a main colour, or variations in print, texture, embellishment and trims ? Even in my minimum wardrobe, I would be unhappy without cream/ oyster/ caramel. . . nubbly textures. . . low contrast prints. . . a little embroidery or lace. . . a small ruffle. . . subtle deviations from classic style elements. . . I may wear mainly simple styles in light neutral colours, but I keep thinking of ways of adding inherent interest to these simple clothes. I’m a happy scarves and bags person, with a few brooches/ pins and bangles – but my accessory choices are not attention-grabbing. My style comes between ‘all the interest in accessories’ and ‘all the interest in the clothes’. What type of minimalism ? Perhaps you like the idea of a small unobtrusive wardrobe with few style elements – but not this particular version. Janice’s ‘common wardrobe’ has 3 very similar tees, 3 very similar shirts, 3 very similar pants. Slight differences in colour and fabric. Plus 3 knits with the same fit, colour and texture. That makes these clothes easy to interchange and co-ordinate into ‘background’ outfits. As I’m not such an accessories person, I go along more with Judith Rasband’s idea (Wardrobe strategies for women ). If you only have a small number of blouses etc., then you want them to be as different as possible in colour, fabric and style (while still co-ordinating with your other wardrobe capsule items). So you can get very different looking outfits from your small number of clothes. But that’s a different strategy for wardrobe building and getting interesting outfits than the accessories based approach. And – if you like variety/ interest in your clothes rather than your accessories – which clothes ? Many wardrobe plans have equal numbers of tops, bottoms, and layers, but that isn’t right for me. My bottoms (pants) are ‘background’ and I have few of them. In winter I wear lots of layers. My tops can hardly be seen, so are simple basics. But I love variety in my pullover tunics, vests and loose jackets. And which style elements do you vary ? The interest in my clothes is not just in the layers. It’s particularly in the neckline/ collar, which draws attention to my face. You may like style elements to draw attention to your bust, waist, rear view, hands, legs. . .
How much variety do you like ? and what type ? The simplest possible clothes as a background for accessories – good for a travel wardrobe, as scarves and jewellery don’t take room to pack. But perhaps minimalism in clothes is not a good everyday style for you. Which clothes do you like to have a wide variety of ? Or can you be happy with just a few different styles ? And what sort of variety do you like ? 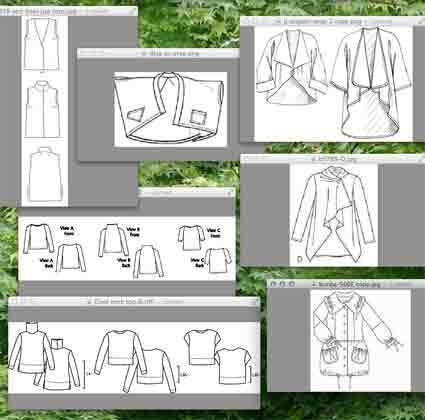 – style elements such as collars, cuffs, added seam lines. What are your personal favourites to add to this list ? Of course you haven’t got to be so analytic. Just notice what you like to wear. I think like this because it helps me understand why most wardrobe plans don’t work for me. This entry was posted on November 10, 2012 at 9:09 am and is filed under personal style. You can subscribe via RSS 2.0 feed to this post's comments. Both comments and pings are currently closed. I’m not really sure – I know I’m a fan of texture and I think I am happy with just a few silhouettes. I certainly don’t want (for example) two skirts in the same fabric, even if one is an a-line and one is a straight skirt. But I’d happily have a smooth straight skirt, a tweed straight skirt and a sparkly straight skirt, even if the colours were similar. I’m happy making multiples of the same pattern in different fabrics too. A small variation is enough to satisfy me. Yes Lynn – a classic retirement problem 😀 Happily nowadays there are many ‘stylish’ casual tops and jackets which can be made in fleece – so we can wear cosy practical fabrics and also look good. Last year I wrote a couple of posts on more interesting patterns for sweatshirts and hoodies, and there have been more published since. Hmmm, those are good questions, and I am not sure exactly which category to put myself in… I definitely have one chosen silhouette, and wear only a limited color palette, so those are not where I get variety in my wardrobe. I do choose different textures, pretty much only wear natural fibers. I love interesting woven in patterning in fabric, and I vary the layers of embellishment and details on the few patterns that I make up over and over again. One year I made the same pattern (a basic dress) in six very different fabrics. Since a staple of my wardrobe for much of the year is a pinafore worn over a dress, this added far more variety to my daily outfits than it would sound like, since my limited color palette meant that any of the dresses would work with any of the pinafores. I definitely do not have much in the way of voluminous clothing as I don’t want extra fabric flapping about. So while I might occasionally be tempted by waterfall fronts, thin trapeze jackets, pirate sleeves, tie sleeve ends, etc. I end up getting rid of them. I guess I like a streamlined look and feel. My summer clothes are my favorites and I now wonder if that’s because they’re all a smooth fabrication. I love looking at rich, thich texture (on someone else) and, again, get tempted occasionally, but end up purging thick sweaters. Though sometimes, psychologically depending on how weather looks, I crave at least one thick sweater. Just bought a fisherman sweater, so now I have ONE, and it’s a great success because all the past fisherman sweaters, pullover and cardigan, have been purged as too yellowish a white. This one is slightly to the pinky beige side and the cooler white works for me. So I guess I often approach variety as a way to have an example of something. I know that I don’t want embellishment on clothing, though a favorite twin set is mulberry with some beading and sequins in similar tones, so that it’s just over subliminal and just winks occasionally. I love twinsets and can never get my mind around thinking they are stuffy or frumpy. I guess that means that I want as few pieces of clothing as possible in terms of layers yet I like to have some cover in the form of a third piece. I mostly do want smoother textures but I do like an overall low texture in some pieces and I even think of certain overall low contrast prints as texture. I love tweeds but try to avoid them as they often contribute a soft, blurry, lumpy look and I want that briskness. Saw a woman hailing a taxi who had a wheeled luggage cart and the most glorious emerald and off white tweed 3/4 outerwear jacket. Clearly a tweed but tailored within an inch of its life as every single edge was knife sharp. No sweatery give to it. THAT’s what I’d love. I do wear jewelry and scarves sometimes but, though I like them impactful, I don’t want them to stand out or pop. I want them to be part of the whole outfit. I wince whenever someone calls out to me that they like a particular piece of clothing, though I would venture to say that in some way most of what I have is a statement piece. I love emphatic shoes but have learned not to buy anything in too bright or unusual a color because I don’t want people focusing on my feet. Though I’ve had women call out to me from across a street that they loved my shoes and they were a midtone of distressed sage green and had a man pass me by and comment on some beige suede look perfed shaft cowboy boots. Sage and beige, could they be more nondescript? So you can’t win. I like sheen but not shine. I love clothes that indicate a waist or shapeliness but do it without being belted. I’ve recently gone through my coats with an eye to purging some and see that I’ve switched to straighter, slim coats, unbelted. I’ve gotten rid of most of the trenchcoats I used to have. I’ve just realized that I hate relaxed looking clothes. I admire them on others but they make me feel frumpy, dumpy and like I’m trying to ward off a cold. I’m trying out a couple of sweaters that have long cascades but are in a silky rayon that is striped mostly black and white with some stripes in beige, cinnamon and for the other one in grey, ocean blue. So I’m seeing if the snappier texture and pattern will offset any languid feeling. The scarves I like most are shorter and can be knotted simply with short ends sitting perkily – in other words, I don’t like the look of luxurious folds of fabric or droopiness. I have beautiful scarves like this but never seem to wear them. I like things like piping, tipping, saddle stitching, thin black ribbon lines stitched around a pointed collar. But I go for moderation otherwise I start to feel like a cartoon drawing of myself. But again, I can see the craving for the emphatic element, in this case the outlining. Part of the reason I don’t want a lot of layers is that I don’t want things shifting around. I put it there, I want it stay there. I avoid dresses or tops that need camisoles. Almost all camisoles look like underwear or sleepwear to me. I still kick myself for not buying a couple of silky foulard ones in mid jewel tones. And I do own an emerald green silky one but have not found any use for it yet. This not liking layers extends to jackets. I am drawn to jackets but I think I like them best as a kind of frame around me. I have plenty of statement jackets, though. Still I want even those to have a mid level of contrast with what I’m wearing. I hate the look of jackets and skirts from the back – too patchy, blocky. Pants and jackets is tolerable to me. I generally want all my jackets to fit closely and be so comfortable that I barely feel them. I vacillate between hating to feel restricted in any way by my clothing and also enjoying a close, snug feeling. Hard to hit that sweet spot. I guess I like my jackets to fit like a thin, snug sweater. Although I have a lot of shoes and boots, this is mostly because I’m looking for comfort and even footwear that I’ve worn successfully for months can suddenly start causing me pain. I’m not really a “shoe person” and would love having, say, a black (or charcoal) and a cordovan (or maybe saddle), same style and call it a day. I do feel I need the right handbag to complete the picture in terms of color added, shape, right size but othewise am not interested in having any “it” bag or anything recognizable. I hate the diagonal strappiness of crossbody bags but often choose them because they leave my hands free. I don’t feel right with most hand carried bags (other than clutches) because I am five feet tall and they can easily hang down too low or look too big. I like hats. I like jaunty hats the best. I shop by color and pattern. I want the pieces themselves to be the opposite of art clothes. I want each piece to be simple, logical and traditional enough in execution that the average guy who knows or cares little about women’s clothes to be able to sum up any of my pieces in one word: jacket, skirt, pants, bright, flowers, checks, leopard, zebra… One of my trenchcoat exceptions is a shorter zebra print! That may sum up everything I’m looking for. Since it’s a stretch fabric close fit it’s brisk, implies movement, physical in that shows the general body shape, emphatic, energetic, staccato yet constrained in an allover pattern. I tend to think of my jackets as the jewelry, even more than my jewelry. So I will wear the jacket in place of any jewelry or accessory. Goodness Vildy – this has certainly stimulated you to thought ! Your idea of a jacket as jewellery is good. I think it encapsulates this issue of how and where we want the ‘sparkle’ in our wardrobes – meaning that in a general way, not literal shinyness. I’m in the color and surface category. 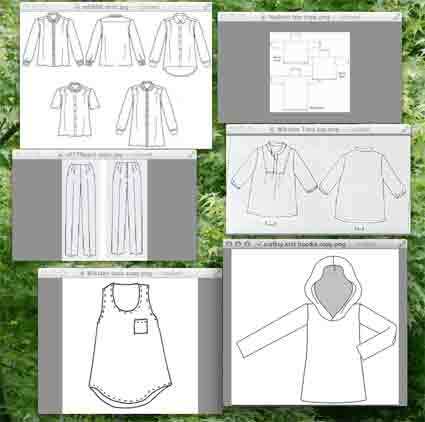 The clothes I make are pretty simple, with little to no embellishments, and I tend to sew tried and tested patterns over and over again. But handling fabric brings me joy. Right now I’m sewing a cardigan in a taupe wool knit with a very interesting tiny waffle texture and several days ago I found a matching taupe charmeuse which looks wonderful with the waffle knit. Such a lovely contrast in textures! This is what I get excited about. I intend to make a top to wear with the cardigan for a different kind of twin set. If I didn’t sew, I’d probably be more concerned with finding clothes that fit and flatter than with texture. I do sew, and am in control of fit, plus I get to play with fabric. I put a lot of work into the clothes I make so I kind of feel like they should speak for themselves. My accessories are minimal, except for scarves, but that’s also fabric. other than that, I use the same bag almost every day, and I could easily wear the same pair of booties for the whole fall and winter season. I rarely wear jewelry. I like variety in both color and texture, mostly. I feel fine about making the same pattern several times, as in my experience even if you point it out most people are unable to distinguish style differences within the same color. And that’s especially true of pants, which are totally background in my wardrobe. I am however trying for a more integrated color approach, in order to have a more useful wardrobe. And I’ve also found that while I love prints it’s best if I keep them to tops, and better yet if I keep them fairly low-contrast. I’m making more deliberate efforts to vary silhouettes, in order to look more current. I also enjoy some experiments in style such as weirdly-cut japanese stuff. But I’m also finding out that I need to wear something that’s either weirdly cut OR a wild print, not both at once:-). In fact slightly marled grey seems perfect for my weirder stuff..
One thing I don’t have or want variety about: comfort. I have no capacity to suffer in order to be beautiful. But on the whole I’m still kind of 50s in terms of liking simplicity coupled with very good quality fabrics.. I find I can get away with a lot more comfort if I do it in good fabrics, ie elastic-waist pants in good wool. Well done M-C to find a way of wearing more unusual clothes that works for you. I’m fascinated by the cut of those styles, but would not feel ‘me’ if I actually wore them. So good for you ! I just have to let my inner nerd take over and think only in terms of geometry :-). But really, it helped me to realize I don’t have that high a Flamboyance Quotient to be making the Miyakes in fluorescent fake fur.. We don’t see any pictures of you :-), but I’d imagine you may actually feel happy enough if you tried some more interesting shapes in very, very neutral colors? A loose draped t-shirt for instance? My stomach gets ever larger, and I’m very conscious of styles that cling below the waist – make me look all hip and no upper body. . . I am interested in the ‘new’ over-sized shirts, made in a non-cling woven. Drapes and asymmetry are a bit low on my list of favourites !